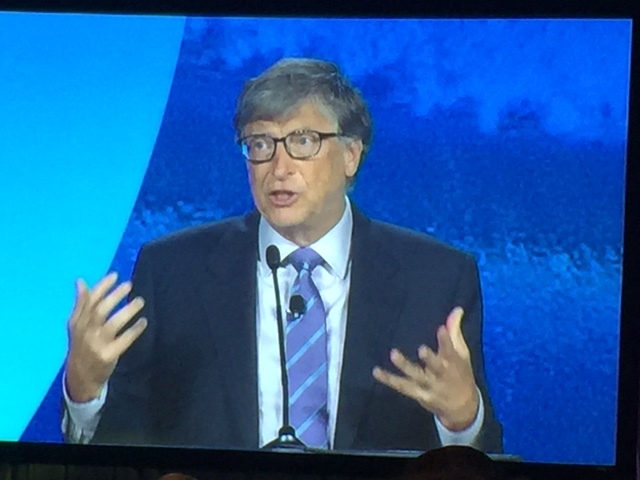 Bill Gates speaking about schools and ed tech at the ASU+GSV Summit in San Diego on April 20, 2016. Education technology is still at its earliest stages and has yet to live up to its promise, philanthropist Bill Gates told an audience of thousands of ed-tech entrepreneurs and investors at the ASU GSV Summit here. “We really haven’t changed [students’ academic] outcomes,” he acknowledged. But over the next decade, Gates predicted that the industry could move to a new level of quality as ed-tech providers begin to understand student and teacher needs. “We can surprise people by really making education better—both here in the United States and around the world,” he said. Within the next five years, Gates expects most schools to be using personalized learning in at least one way, but it’s a shift that will require more than just technology. Even the layout of the classroom will look different, he said. “It’s a big challenge, and it’s great that we have early adopters showing the way,” he said, pointing to Summit Public Schools, and its Basecamp initiative in the summer that brings teams of principals together to see how personalized learning looks in action. For literacy, he said he favors products like ThinkCERCA that “meets kids where they are” and helps them with writing. One approach that would accelerate the promise of personalized learning, he said, “would be deeper engagement” between teachers and entrepreneurs. “Far too many of these digital products aren’t really getting used,” and he encouraged entrepreneurs to continually improve upon and optimize the products that do find success in the classroom. Using well-designed trials to develop new products is essential, Gates said, which is why his foundation has invested in LEAP Innovations, a nonprofit based in Chicago that conducts such trials. “I believe this idea of head-to-head testing needs to come at different levels,” he said. As a product passes through the first level of proving efficacy, an investment will be needed to get even stronger evidence of its value. “Investors are going to have to take the long-term approach…because these studies are expensive and take time,” he said. While teachers’ limited access to digital learning devices has held back progress in teachers’ use of ed tech in recent years, these issues are starting to diminish, Gates said. Schools need to see some examples of products that are clearly so successful that districts are willing to spend for them, “but I’d say we’re pretty early in that process,” he said. While many teachers are willing to be pioneers in trying ed tech, district-wide adoptions often don’t get the desired results. “We have to see why,” he said. The market for digital instruction materials will likely grow by $1.1 billion between 2015 and 2020 in the U.S. alone, Gates predicted. Interest in education outside the U.S. is very strong, too. Last year, funding for ed-tech companies in China doubled, for instance. But Gates gave investors and entrepreneurs a pep talk, saying the work they are doing is critical. “Many ambitious dreams have been achieved,” he said, citing President John F. Kennedy’s promise to go to the moon within a decade—and the country beat the deadline by six months. He also drew inspiration from breakthroughs in preventing diseases, pointing to the small cadre of people who believed smallpox could be eradicated. “At the end of the day, I believe success comes to innovators who focus on new needs,” said Gates. Among them: Why are kids dropping out now? Why are costs going up? Innovators who engage teachers and students, and who invest in product design taking needs into account, are the most likely ones to be successful. I wonder if Bill Gates or anyone in his employ, or those in the numerous non-profits and other groups that the Bill and Melinda Gates Foundation funds and keeps afloat, or any of the investors in this shiny new enterprise of 1:1 digital learning have availed themselves of the many scientific studies that are raising the alarm about the increasing and constant wifi radiation that school children are being and will be exposed to through all of the “innovative” learning. If you are at a loss where to look, here is a place to start: http://safetechforschoolsmaryland.blogspot.com/ Investors should look into the potential for staggering lawsuits if widespread harm comes to America’s public school children due to wifi exposure. All of this is in addition to the fact that so many of the software programs that districts have bought into and teachers/students have been forced to use are disgracefully ineffective as well as a waste of scarce resources. Children need human teachers who interact with them as individuals–this is personalized learning, not learning monitored and assessed by computer algorithm. Gates, for all his ostensibly good intentions, also seems blissfully unaware of mounting evidence pointing to neurological dangers of screen usage. (See: http://www.technewsworld.com/story/74172.html). Why would and educator or a parent want to subject their child to this kind of reckless social experiment? He is not unaware. He doesn’t care. He cares about $$$$$$ and nothing else. He is power hungry, narcissist. Shiela, do you think we should stop children from watching TV or using their cell phones? Many electronic devices have similar effects. Do office workers who are in front of monitors for most of the day suffer any ill effects? I see nothing but positives for the application of educational technology. All that is needed is an informed instructional staff skilled in the integration of technology into education. Technology is a tool that must be integrated into the classroom. It is not a replacement for interpersonal and collaborative learning, but rather an enhancement. The problem, as I see it from decades of experience as both teacher and principal, is that there are still too many teachers relying on the chalk and talk methods. Improvement will come with the retirement of those unable or unwilling to incorporate technology. Chalk and talk were effective for Socrates, Plato, and Aristotle; Galileo, Newton, and Einstein; Homer, Chaucer, Dickens, Tolkien, and so many others. Technology is not NECESSARY to teach students how to think and reason and problem solve. Could some technology be useful in assisting teachers in helping students who need additional practice? Sure. Can some technology make completing tasks more efficient? Sure. But, is technology NECESSARY to save our schools? Certainly not. Pre-progressive education, teachers had degrees in the subject matter they taught. Now teachers are trained like trade school. Teachers need to be respected as educated professionals, not treated like workers in a factory learning how to make a better product. Schools don’t NEED better products, they need to return to tried and true methods of instruction that once served humanity well. Well stated, G Charest! Technophobia is the basis for rejection of educational technology. Too often, those rejecting the use of computers to enhance education look for negatives like “too expensive”, or “harmful to children.” All the positives are overlooked. I predict that all this criticism will subside as a younger crop of individuals who are thoroughly familiar with technology enter the teaching profession. It is long past time to get Gate$ out of doing anything with education. He’s already been front and center of funding CC and it’s been a complete and utter disaster. Kids are dumber than they’ve ever been. No basic math or English, and kids are graduating without even knowing how to divide! The Common Core “standards” were written by test company employees, none of which had any K-12 teaching experience, including the lead writer, but he went on to head the College Board, so he could screw stuff up there too. This is all by design folks. They don’t want smart kids. Wake up! Call your senators and congressmen/women and tell them to take on the MA standards before CCSS. There is no place in education for entrepreneurs because that suggests that it is a profit center for some corporate interest. What we need in public education is more emphasis on the professionals, the teachers who actually do the work of education. Fund them, protect them, help them, and we will be well on our way to better education in the future. All the bells and whistles are just expensive distractions from the real work that is done by our great teachers if they are respected and supported adequately. Gates, the Lumina Foundation, and ALEC are all out to undermine public education and we should treat them as we would the plague. The Gates plan for 100% online learning, no matter how adaptive, is doomed to ultimate failure. Machines have limitations. Human relationships are a huge, integral, and irreplaceable part of teaching and learning for most kids. A computer screen can’t do that. If computer screens ever do gain the capacity to do that somehow ( a smile, a touch, a hug) the human race will be sunk no matter how much cash Gates and the tech industry have managed to pull out of the system in the meantime. Will the future be humanity, or machines? Are we all truly willing to sacrifice humanity longterm just so the tech industry can increase its short term profit levels and its control over the human race? Research G.E.R.M. We’re already more than halfway to “1984”. The Gates plan for 100% online learning, no matter how adaptive, is doomed to ultimate failure. Machines have limitations. Human relationships are a huge, integral, and irreplaceable part of teaching and learning for most kids. A computer screen can’t do that. If computer screens ever do gain the capacity to do that somehow ( a smile, a touch, a hug) the human race will be sunk no matter how much cash Gates and the tech industry have managed to pull out of the system in the meantime. Will the future be humanity, or machines? Are we all truly willing to sacrifice humanity longterm just so the tech industry can increase its short term profit levels and increase its control over the human race? Research G.E.R.M. (the Global Education Reform Movement), the tech industry/ Wall Street/big corporate/billionaire plan to take over public education for fun and profits, and for world control. Scary stuff and happening now. We’re already more than halfway to “1984”. The irony is that while Gates is trying to monetize the public school system to make it more profitable for him and the other carpetbagging “education reformers” under the guise that it will benefit our children, his own children attend a private school that is technology free. Let him experiment on his own kids first, before he uses my/our kids as his guinea pigs. Independent Voices for Better Education, Inc., pioneer in ed reform since 1990, has known and warned about the for-profit schemes that prey on our families and teachers. Gates is no exception to the profiteers. It is a disgrace that Common Core and all that goes with it has been allowed to roll over us and cause such havoc. But Microsoft made billions, along with Pearson, et al, and that was always the goal. See our website http://www.ivbe.org homepage. Gates admits in a Harvard interview (44 minutes and 23 seconds into it) that it might take years before they know if their “stuff” works. Meanwhile, we’ve lost another generation. An outrage, and people are now realizing and fighting it. So, “Personalized learning” means working alone, sitting in front of a computer? Sounds pretty horrible to me. Why would we subject our children to this fad? That is not learning. Human relationships are central to education, not something to be phased out by technology. I’m sad for Gates’ misunderstanding of the human condition. And remind me, why does this man have so much power? What office did we elect him to? What expertise does he have? Who out there believes Gates, Obama, Duncan, or any of the banksters and hedge funders that drive the privatization of public ed send their kids to the kinds of schools Gates espouses? Providing school education is not a business. It is sheer money power which makes Gates think that just because he built MS into a big business, he can also “manage” school education. The only way education can improve is if Bill Gates leaves it alone. If you want to do something for education, Bill, go back to school – finish it this time. Get your teacher certification. Teach for a minimum of 5 years in a public school ( NOT charter), and then maybe you will begin to comprehend what is needed — but only if you leave your ego behind! There is no magic bullet! And for most students tech gadgets will not help them learn more, or learn better…it will only add to a distraction from learning. It starts at home with parents who read and talk to their children, expose them to new ideas and the activities that they share with them. Kids need to be active, play outside, explore, read, listen to music and do hands on projects for real learning to occur. Manipulating someone else’s software and relying on technology to educate our kids is a total myth. It won’t be the magic bullet the hardware/software companies and school administrators/teachers are promising. I don’t tend to prayer, but all I could think was Dear God let Bill Gates find another hobby to occupy him instead of public education. He has done such catastrophic damage already. Bill Gates needs to take a high dive into shallow water. The man knows how to make money he knows NOTHING about education or the development of children. His own children attend a NON-COMMON CORE private school. So please anyone that takes advice from this narcissistic fool and his wife should join him in that high dive into the shallow waters. I am sick of this man and all these other millionaires/billionaires that have nothing better to do than try to control things they know nothing about just because they can. How is it that Gates thinks he knows all about education and best practices? He is a businessman with no background in ed whatsoever. The fact that he can throw his weight around and exert the influence that he does is a black mark on our capitalist system, which basically posits that people with money know everything and can do anything they want. The damage he has wreaked is tremendous. And it’s all about making more money (like he doesn’t have enough), not helping poor kids. Finland, which is widely considered to have one of the best school systems in the world, doesn’t allow politicians or outsiders to make decisions about ed, only professional educators. Imagine that! Bill Gates and his wife are not teachers. He has this crazy dream about teaching and learning that is totally out of this world. In fact, I love how all these non-teachers in government and such that want to tell teachers how to do their jobs! Personalized learning, RTI, PLC, NWEA, MEA, Lucy Calkins, Everyday MAth, Invision MAth, BLT, ATT, PBIS, the list is so long, it’s no wonder teachers leave the profession. I am sick and tired of articles that address education and how to fix it. It’s not broken! We know what to do and how to do it. Educators do not go into other peoples jobs and suggest ways for them to improve. IF you are not a teacher, get out of our jobs! “One approach that would accelerate the promise of personalized learning, he said, ‘would be deeper engagement’ between teachers and entrepreneurs. ‘Far too many of these digital products aren’t really getting used,’ and he encouraged entrepreneurs to continually improve upon and optimize the products that do find success in the classroom.” Here is Gates’ worldview in a nutshell, in his own words. Teachers, instead of engaging with their students, ought to engage more deeply with entrepreneurs. Then the entrepreneurs can improve the products to market to teachers who neither want nor need them. It’s a business plan, not an education plan. Bill Gates has for his lifetime, made mediocre products at best. His foray into the “Ed Biz” shows the exact same level of competence, and good teachers know it. An Open Letter to Bill Gates, Please do not think that all educators are against your efforts to improve K-12 education. I, for one am not and fully appreciate your efforts. I became involved in ed tech in 1981; I was sold on its potential back then. Unfortunately, many educators looked for reasons to downplay computers. Many in the profession are conservative and abhor change, especially that which is mentally challenging. Your emphasis on professional development (PD) is well-stated. In relation to educational technology, it should begin at the teacher preparation colleges and continue in public schools. Three suggestions for for K-12 schools: (1) ed tech PD should be ongoing and delivered in half hour sessions, (2) teachers should be given assignments using what they have learned, and (3) their progress should be evaluated. I believe a breakthrough has occurred with the advent of cloud computing. This has led to low cost laptops (Chromebooks) and a reduction in the cost of implementing and maintaining a 1:1 distribution of devices. The need for computer labs and LANs in schools is largely reduced. Also, the likelihood of students having access to their laptops 24/7 is becoming a reality. I look forward to the day when K-12 education has fully embraced ed tech. I am an 82 year old retired educator and hope this happens in my lifetime.